Robotics is changing the way we do business forever. And we’re quite certain you’ll want to do more than just sit on the sidelines and watch this disruptive technology take hold. You’ll want to play a meaningful role in it. You’ll want to profit on it. 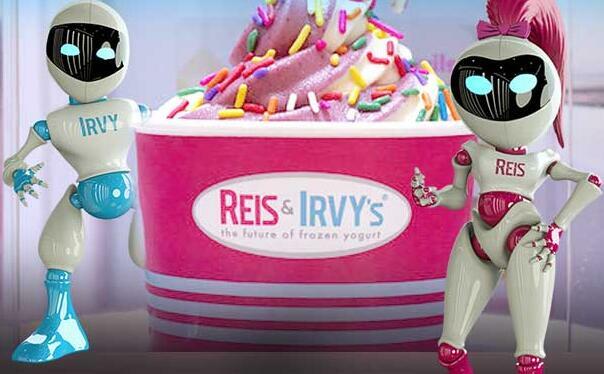 Reis & Irvy’s brings the novelty of robotic delivery to the fun experience of selecting and savoring frozen yogurt. It’s the ultimate blend of technological innovation mixed with anticipation, fascination and sheer satisfaction. Of course, you’ll find the most exciting thing about this revolutionary new concept in frozen yogurt is the low maintenance and high efficiency of the Reis & Irvy’s Froyo Robot. This automated, on-demand unit is a quick source of revenue as well as an animated attraction. This exclusive, patented new technology will make history, and you are invited to join us. The streamlined economy of our franchise model is equally matched by the compact self-sufficiency of the machine itself, making it a practical business choice for any enterprising operator. Get ready for a solid future. “Some day” is already right here. We’ve identified tens of thousands of viable locations across the country to that will benefit from this profitable opportunity. Our efforts are focused on specific territories that will support our existing and future franchisees. 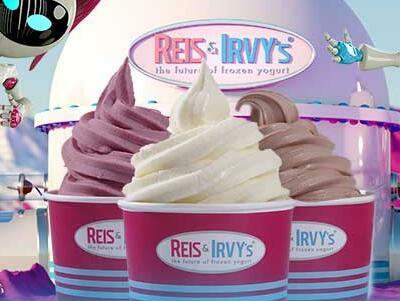 Is the Reis & Irvy’s froyo machine the right fit for your location? Our team of analysts continuously study the foot traffic, socio-economics, and demographics of locations to spot favorable markets. They are an invaluable resource to help your location succeed as a host for a Reis & Irvy’s franchise. The froyo machine is an active profit center as well as an entertaining attraction. A high return yielded in such a small footprint is just one of the many benefits of hosting this exclusive, patented new concept. By virtue of its compact dimensions, the machine generates more revenue per square foot than any other on-site service or product offering. The profit sharing model we offer makes this an enticing opportunity for discerning facilities and floor managers everywhere. How much do people crave frozen yogurt? When asked their preference between frozen yogurt, ice cream, gelato, and snow cones — an overwhelming 78.9\\\\\\% of the population chose frozen yogurt. 94.6\\\\\\% stated they believed frozen yogurt was healthier than ice cream. Our frozen yogurts have Certified Live and Active Cultures with probiotics. As people adopt healthier diets and adapt to dairy intolerances and sensitivities, Reis & Irvy’s froyo machines are ideally poised to offer a tasty treat for everyone. 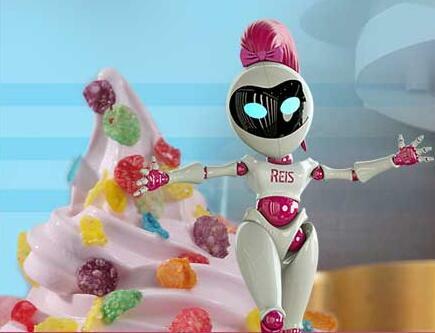 In fact, with the Reis & Irvy’s Froyo Robot, the options for delivering your customers delicious creations are endless. Not only can you tap into rising consumer trends, but also capitalize on government mandated wellness initiatives in public locations such as schools. We are reinventing the frozen yogurt franchise. Requiring far less investment, labor, and overhead of a retail storefront, the frozen yogurt machine makes it easy to succeed in this category. Plus, our froyo machine generates a higher yield per square foot than any other frozen yogurt retail model and operates 24/7. Reis & Irvy’s holds exclusive rights to this brand new technology, entering the frozen yogurt market. This means a totally new, unique category that combines robotic delivery with frozen yogurt franchising. Bringing the world’s first robotic frozen yogurt machine to market, we offer a fresher product with a much healthier profit margin for you. Our franchise opportunity takes a traditional retail store operation – and compresses it all into our portable Froyo Robots. No more employees, no more store leases, and no more bulky inventory. All Reis & Irvy’s franchise owners receive comprehensive training in order to understand the technology, our marketing methods, proprietary location procurement techniques and most importantly how to be the best operator. We help you understand how to make our Froyo Robots work for you and your community. Reis & Irvy’s Froyo Robots are installed, maintained and serviced by our national network of operators, providing you premiere service and support around the clock. From installation to instant sensation our robots drive traffic and revenue directly to you!